The Eastside’s best pizza in a lively Los Feliz storefront. : While there are a few arguably good, even great Eastside pizza joints, Mother Dough may just be the best among them. It’s a pretty storefront spot, if a tad romantically underlit, with lots of exposed brick and a roaring wood oven that reaches 1,000 degrees. It’s convivial; if you live in Los Feliz/Silver Lake, you’ll almost always run into someone you know (especially if you wait in the line long enough). There’s an eclectic craft beer list that features the likes of Icelandic Pale Ale, and carefully chosen boutique wines, many from Italy. Sophisticated starters amp things up; a silky white anchovy crostini, along with the well-composed fennel salad sporting almonds and orange, could alone make a pleasant dinner. 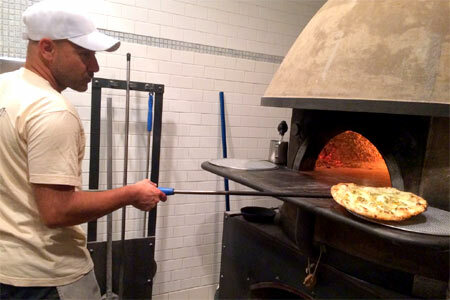 But chef/owner Bez Compani’s Neapolitan-style pizza is destination-worthy, made from a sourdough starter that yields a crust that's nicely charred and just chewy enough, with a depth of flavor. Purists go for the margherita with buffalo mozzarella. A pork belly pie strikes a fuller note, its smoky meat offset with hints of maple and chive. The sauceless baby clam version has a delicate balance of clam and preserved lemon, butter and garlic. To finish, oven-roasted pears with hazelnut and crème fraîche hit the right sweet spot.